Logfiles Lied about their No-Logs Policy! Update: IPVanish lied about their logging policies (also to us). You can read everything about it in this article. We do not recommend to use them anymore. In the perfect Internet world, there would only be Internet Service Providers (ISPs) and no VPN service providers. Your ISP would connect you to the Internet, and at the same time protect your privacy and anonymity from hackers and government surveillance agencies. In reality, your ISP does the former, but neglects the latter. A VPN vendor, on the other hand, is in the business of protecting subscribers' online privacy. Below, we review IPVanish, a VPN vendor founded in 2012. Most VPN vendors are based in countries with favorable privacy laws. It is very uncommon for a VPN vendor to be US-based. IPVanish is a notable exception. It is based in Florida and therefore subject to American privacy regulations. Given the recent presidential election of Donald Trump, there is a cloud of uncertainty surrounding future privacy protection policies under a Trump presidency. Furthermore, as a US-based company, IPVanish is prohibited by law to provide services to people in certain countries, e.g., Cuba, Iran, and Syria. This is a hefty price in social equity to pay for one's business location. The citizens in those countries are exactly the people who need the service most for privacy protection. When you establish a VPN tunnel, your Internet traffic is encrypted and therefore, even your ISP cannot decipher your online activities. So, government agencies have turned their attention to VPN vendors. VPN vendors can be subpoenaed to hand over subscriber information, including their Internet usage logs. A subpoena is often served with a gag order. Specifically, the VPN vendor may be bound by law to not disclose that they have been served with the subpoena. In order to increase transparency, some VPN vendors publish a warrant canary on their website. A warrant canary is an online statement that basically certifies the company has NOT been served with a subpoena for a specified time period. A failure to update the statement or its outright removal alerts the subscriber base of subpoena activities. IPVanish does not publish a warrant canary, despite the fact that it operates in a country with strong government surveillance initiatives. Today's Internet users are mobile. Many mobile users rely on public WiFi hotspots to access the Internet. Privacy protection needs to be extended from the traditional Windows and MacOS desktops to the mobile platform. IPVanish supports both iOS and Android mobile devices, e.g., your smartphones and tablets. You can download a VPN client app from the respective Apple and Google app-store. Running the VPN client app will configure and establish the VPN connection. Manual setup instructions are provided online for the less popular Windows Phone devices. OpenVPN is regarded in the industry as the VPN protocol offering the best security while being the fastest in speed performance. IPVanish only supports OpenVPN on Android, but not on iOS or Windows Phone. A kill switch, if available, is the fail-safe mechanism in a VPN. A VPN connection, like all Internet network connections, will drop occasionally. When a VPN connection drops, your subsequent Internet traffic will get rerouted through your regular non-encrypted Internet connection. As a result, your privacy is no longer protected, and you may not even know about it. The probability of it happening increases when you are doing a lengthy and possibly unattended file-sharing download. A kill switch automatically shuts down all Internet connection on the device when the VPN connection drops. IPVanish only provides the kill switch feature on their Windows and MacOS client apps. 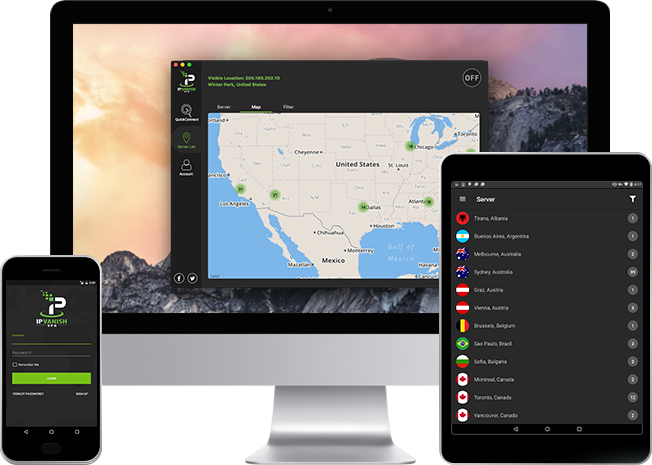 IPVanish operates a global VPN of 40,000+ IPs on 500+ VPN servers in 60+ countries. This is a medium-sized network in the industry. Yet, one should not put too much stock in the sheer number of server locations. A VPN vendor may well decide not to deploy in a certain country for a good reason. For example, in the summer of 2016, IPVanish decommissioned all its servers located in Russia because of the passing of a new law that puts subscribers' privacy at risk. Besides security, speed performance is another important factor to consider when choosing a VPN vendor. Inherently, a VPN connection is slower than a naked connection to the Internet. After all, the data packets need to be encrypted and later decrypted after traveling more distance en route to an intermediate VPN server. The encryption speed is out of the control of the VPN vendor because it depends on the CPU power of your local device and the security protocol you select for the VPN connection. What the VPN vendor can control is the network infrastructure of their VPN servers. IPVanish has been named in various industry awards for its speed. Unlike most of its competitors, IPVanish operates a tier-1 network, meaning that they have their own data-centers instead of leasing network infrastructure from third-party vendors. A tier-1 network is directly connected to the Internet backbone, resulting in faster and more reliable connection. Bandwidth-intensive applications benefit directly from the increased speed of the tier-1 network. Examples are file-sharing (aka torrenting) and video streaming. IPVanish offers subscription plans for 1, 3 and 12 months. The 12-month plan is affordably priced at $6.49 (USD) per month. Their pricing is quite competitive in the industry. Further price discounts are possible using their online coupon codes. If you want a free trial of IPVanish, you need to sign up using the iOS client app. The caveat is that if you upgrade later to a paid plan from the iOS trial, you are not eligible for the money-back guarantee. IPVanish does not provide a free trial for non-iOS devices. If you don't own an iOS-based mobile device, you need to sign up for the paid plan in order to test out the service. The good news is that you have a 7-day buffer period to claim a full refund if you do not like the service. The 7-day money-back guarantee is short given that some competitors allow as many as 30 days. To its credit though, IPVanish has no bandwidth restriction for the 7-day period. Competitors may have a longer money-back guarantee, but to be eligible for a 100% refund, your bandwidth usage may be bound by some upper limit. There are many payment methods available for a subscription plan. Credit cards, PayPal and Bitcoin are popular methods. Bitcoin is, in general, most recommended for protecting one's privacy. You can purchase bitcoins and use it to pay for the VPN service all anonymously. There is one disadvantage when you pay using Bitcoin: you cannot select auto renewal of the IPVanish service. However, this is a relatively small price to pay for better protection of one's privacy which is the reason most people sign up initially. All subscription plans allow you to connect up to 5 devices simultaneously to the VPN. In general, 5 devices is adequate for most individuals, given that account sharing is explicitly prohibited by the terms of service document. Note that you must not have more than one connection using the PPTP or L2TP VPN protocol. The typical user scenario is to have 1 mobile device running PPTP or L2TP, and the rest of the devices, presumably non-mobile, running OpenVPN. This protocol-based restriction is atypical in the industry, and creates unnecessary confusion, if not frustration, among subscribers. Account inquiries as well as technical support questions are handled by their 7x24 support team. Support is provided via email only, no live chat support. Subscribers with a do-it-yourself attitude will find valuable setup and troubleshooting information on their website. If you are interested in general security tips and industry news, you can subscribe to their podcasts and monthly newsletters. IPVanish operates one of the fastest networks in the VPN industry. Their speed is a boon to users of bandwidth-intensive applications such as file-sharing and video streaming. Potential subscribers should evaluate, based on their own requirements, whether the gain in speed performance is worth the higher privacy risk due to IPVanish being under American jurisdiction. Subject to US privacy regulations. Kill switch not available for all platforms. No free trial for non-iOS subscribers. Only a 7-day money-back guarantee.